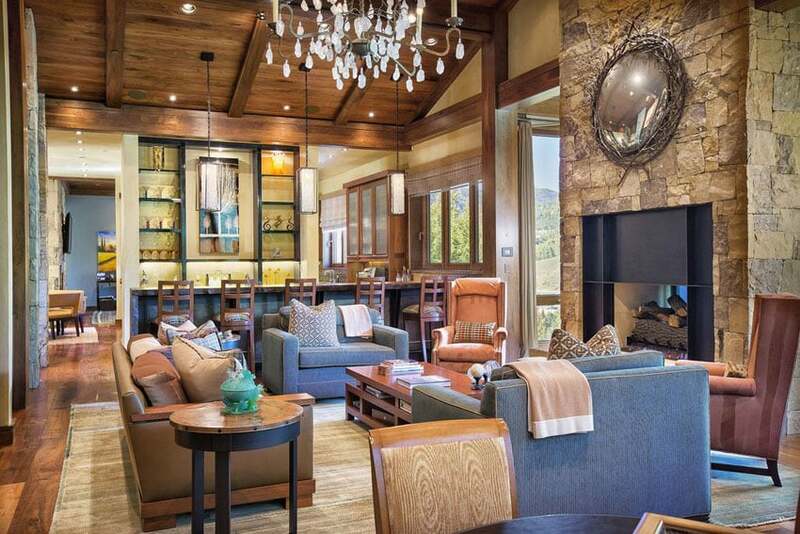 Here is our guide to living room remodel ideas for a variety of sizes, layouts and styles. For most of us, the living room is the most versatile area of the home. It is where we congregate and bond with family, converse and entertain friends, enjoy recreational activities like playing, listening or watching, or spend some quality alone time while reading a book, drinking a cup of coffee or even eating. Basically, living rooms transform themselves into anything we need them to be. With the importance that living rooms present in our home, it is vital to keep its design and layout updated to make sure that it caters to all our needs. And perfect way to keep our living rooms at their best is through remodeling. Remodeling your living room can be a substantial improvement not only for the overall look and function of your home, but even for you the comfort that it gives to you and your family, and for the added value that it contributes to your home. 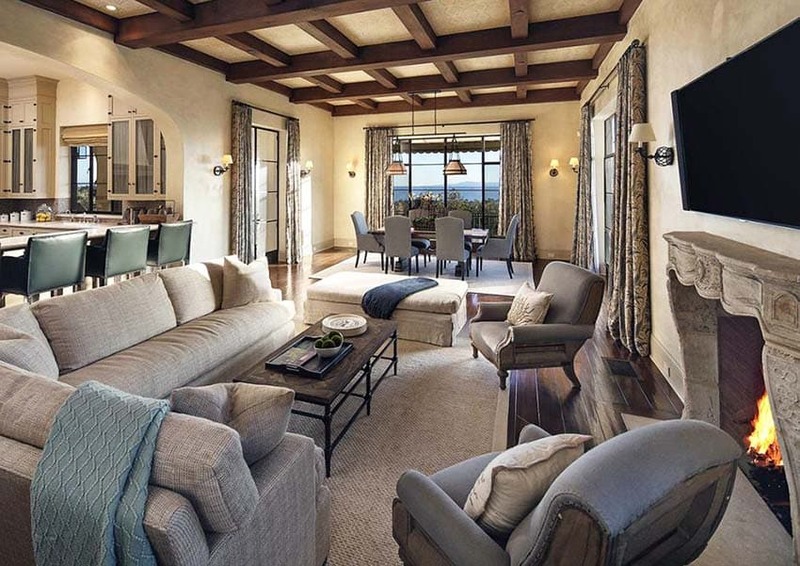 A living room remodel project be a serious challenge as it can bring serious costs. But along with proper planning, one can prepare himself for any possible expenses that may come with the remodeling process. Below we bring you our very own detailed guide on living room remodels, along with some important factors and budget consideration so you can plan and prepare for your home improvement project. What are the things that you want to change in your living room? Before starting your living room remodel, the first thing that you need to assess are the aspects that you don’t like in the space. This may either be limited space, a problematic layout, a drab color scheme, outdated furniture and decor. Your living room may also have a dark ambiance, a gloomy atmosphere or may feel too closed in. It may lack in character or maybe, you just want to give it an update to make it more modern. Once you get an idea of the things that you want to change in your existing living room, you may now determine the level of remodeling that you need for your home. The budget is an important consideration in living room remodels because it allows you to work within your means and prepare all needed funds before you start with the renovation. Whether you are planning a simple make over or a major overhaul for your living room, it is important to know the factors that may affect the cost of your living room remodel project. Living Room Size and Layout – The size of a room is one of the key cost factors in determining the total amount of budget that you will be needing for a living room remodel project. The size of the room does not only determine the total area of the space, but it also partially defines the scope of work for the project. This is mainly because most of the aspects of construction are affected by the square footage of the site and oftentimes materials and labor are priced per square foot. Generally, the overall expense of a project directly varies in relation to the size of the living room to be renovated – a small living room remodeling project would cost less because they require less materials, thus less amount of labor needed. The layout of a living room also plays a significant role in determining a living room remodel cost. Changing the layout may mean adding a full or half partition, extending the space or removing existing architectural features such as a false column, etc. Changes in layout do not only include physical changes in the arrangement of the space, but it also encompasses ceiling layouts, lighting layouts and power layouts. Changes in the ceiling and lighting layout is considered to be a major type of renovation, thus they cost more. Changes in electrical wiring are also critical because the process is much more labor intensive and will require materials such as additional wiring, etc. 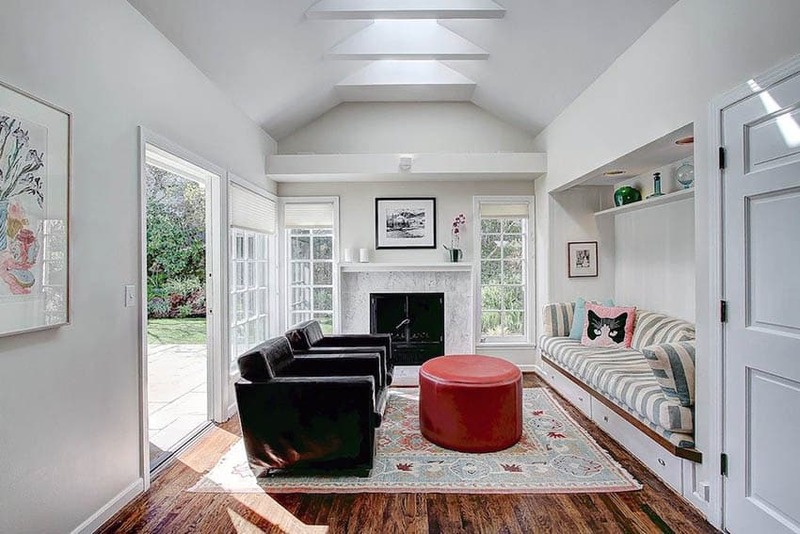 Full or Partial Renovation – Another key factor in determining a living room remodel cost is the nature of the project, whether it may be a full or partial renovation. In terms of scope of work, this is often referred to as a minor renovation or a major renovation. Minor renovation projects undergo partial improvement while a major renovation typically include a more labor intensive process. A minor renovation for a living room remodel project typically includes simple work such as repainting walls and ceiling, installation of wallpaper, changing lighting fixtures, resourcing new furniture pieces, installing a knock down shelf, adding accessories or changing soft furnishings like window treatments, upholstery or textiles – basically anything that does not require an extensive amount of demolition or structural change in the space. Minor renovations may be taken on as a “Do It Yourself” project, especially if you have prior knowledge and experience on such. On the average, minor renovations cost less in terms of labor because it eliminates the need to hire subcontractors or even construction professionals. On the other hand, major renovations for a living room remodel project are more labor intensive, take longer time to finish and typically require professional help. Major renovations may involve structural modifications, demolition work, electrical wiring and typically include improvements done on the floor, walls and ceiling. It may also include a series of minor renovations, thus making it more of a larger scale project in the process. Major renovations are also sometimes referred to as a “full renovation” because instead of just improving a part of the living room, the scope of work requires enhancement and constructions works for the whole space and all its elements – meaning wall, floor, ceiling, furniture, furnishings and lighting. Examples of major renovation works are demolition works like removing an existing partition, tearing down the whole ceiling. Electrical works like rewiring, taking out all old flooring and installing new materials, retiling of floors, construction of a drop, recessed or cove ceiling and the like. For the obvious reasons, major renovations cost more than minor renovation in terms of both labor and materials. They require more materials to complete as compared to minor renovations. As mentioned, major renovations are also best left to the professionals due to their complex nature. As a result, they incur more labor costs. It is also best to keep in mind that when dealing with a full or major renovation for a living room remodel project, it is highly recommended that one should not skimp on skilled labor, especially when it comes to structural, ceiling, flooring and electrical works because substandard work often compromises quality and will cost you more in the long run. Often, work completed during previous renovations or in preparation for a new project can affect the complexity of new upgrades. Finished work may require extra precautions to protect it from damage during demolition and construction, but in most cases, completing a partial renovation requires less time and material than a start-to-finish job. Room Expansion – Some homeowners desire more living room space and one way to attain such is to expand the room and extend it to other areas in the house. Living room remodel projects that include room expansions are laborious and typically involve knocking down walls. Sure thing, the end product is aesthetically pleasing but make sure to take the necessary prep work before engaging into this process. 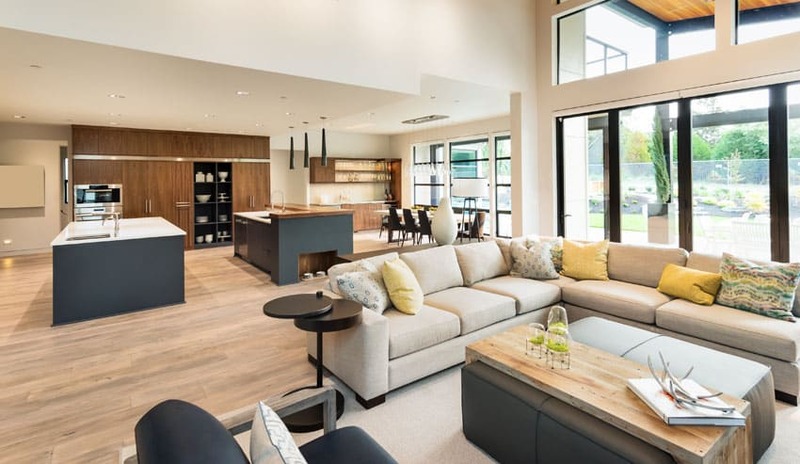 Living room expansions require evaluation of the existing site conditions of the space, particularly the structural elements in the room such as the columns, beams and interior partitions. Be prepared to find other problems as you go like the possibility of termites, mold problems or asbestos. In some cases, there are also load bearing walls that will need additional work for support. Existing outlets, ventilation systems, plumbing and electricity may also need to be moved or relocated. With the possibility of unforeseeable issues, it is best to have a contingency fund to make you prepared along the process. In addition, room expansions for living room renovation projects should not be taken lightly and must be left to the hands of a trusted professional. Scout for a good contractor as he will be able to assess everything carefully, spot problem areas ahead of time and prepare a complete bid. On the average, the labor cost for most living room renovation projects generally represents about 15 to 30 percent of the total renovation costs. Hired construction professionals may either charge on a per hour basis or a lump sum amount, while the rates vary depending on the state or location of the project. Materials, in general, account for at least 70 to 85 percent of the total project costs for a living room renovation. Materials include all finishes which will be used for construction, so this includes flooring, wall treatments like paint, laminates or wallpaper, ceiling boards and frames, electrical stuff and other consumables. • Flooring – Changes in the flooring are considered to be an important upgrade in a living room renovation project. Existing living room floors that have light scratches may either be refurbished or refinished, however if the damage is more extensive, replacing the floors may be required. Changing the floor may also be a result of aesthetic preference or an update in style, meaning if your living room has existing ceramic floor tiles and you want to change it into a more rustic inspired space, then you might need to change it with wooden planks. There is a wide range of flooring options for living rooms which are available in the market. Carpets are ideal for living rooms that are intended to be used as an entertainment space for watching TV, since it provides a soft cushion where you can sit. Carpeting is also considered to be an affordable flooring material for living rooms. Wood flooring is another popular flooring option for living rooms as they are highly durable, can withstand daily wear and tear while adding a dose of natural warmth and coziness to a space. However, wood flooring is harder to maintain and is more expensive. Ceramic and porcelain tiles are also another cost effective option because aside from their broad spectrum of color and patterns, tiles are very durable and ideal for high traffic areas. Tiles are also the best option you can explore if you are planning to extend your living room to the kitchen or keep an open plan. There are several ways to save on flooring costs for a living room remodel project. Ceramic floor tiles, for example, may be regrouted as long as their surfaces are still in good condition. Wooden floors that have light scratches may be re-sanded and reapplied with stain to give them a more fresh look. Natural stone floors may be rebuffed and resealed, while carpets may be industrially cleaned. For a minimal amount, these minor improvements can instantly transform the look of your living room. On the average, flooring installations range from $400 to $1800 per project, depending on the material or type of flooring, the size of the room and the necessary prep work required before installation. Added expenses for flooring are typically incurred for living room renovation projects which require extra work such as the removal of old floors or the repair of sub floors. Each type of flooring material also has specific installation and prep requirements, so whether if you are dealing with wood, ceramic tiles, vinyl or carpet, make sure to discuss these options with your contractor. • Walls – Walls comprise a large amount of the interiors of a space. They are considered to be a major visual element which can make or break the overall look of a room. And because of their impact in a space, most home makeovers and improvements typically involve changing the color or finish of interior walls. Updating the walls of a living room range from a simple repainting work, applying textured finishes, wallpaper installation, custom paint treatments to the installation of a drywall or a stone accent wall . The simplest and most cost effective fix to transforming the look of walls in a living room space is through the use of paints. A fresh coat of new color can go a long way in terms of the visual interest and mood that a living room projects. Aside from regular latex paints, some suppliers offer special variants that have layers of colors and textures which produce a more unique finish. Wallpapers, on the other hand, involves a more meticulous installation process because it requires prep work such as skim coating to even out the surface, the application of a metylan adhesive and the careful laying of the wallpaper itself. Typically, the installation of wallpaper is done by a professional and may either be charged on per roll or per foot basis. In general, wall treatments for living room renovation projects can run from $500 to $2500 per project, depending on the material, the type of finish and the amount of prep work needed to complete the project. Other factors which greatly affect the cost of wall treatments for living room renovations are the size of the room and the height of the wall, since they determine the full area of material coverage. • Ceiling – Ceiling works also take up a large part of the costs of any type of renovation project, mainly because of the extensive amount of work that they require. For living room remodel projects, minor ceiling renovation works may range from simple repainting and repair. While major ceiling renovation works range from removing old ceiling boards to replacing them with new gypsum boards to the improvement of the ceiling layout and design. In some cases, the ceiling is given a whole new look by installing recessed, drop or cove ceilings. 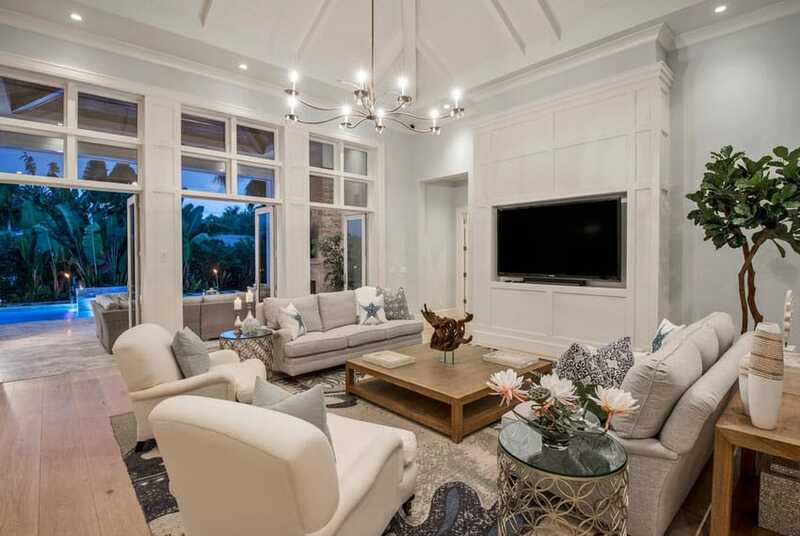 Other options for living room ceiling finishes are textured panels, wallpaper, wood accents, creative paint treatments and other trim finishes. 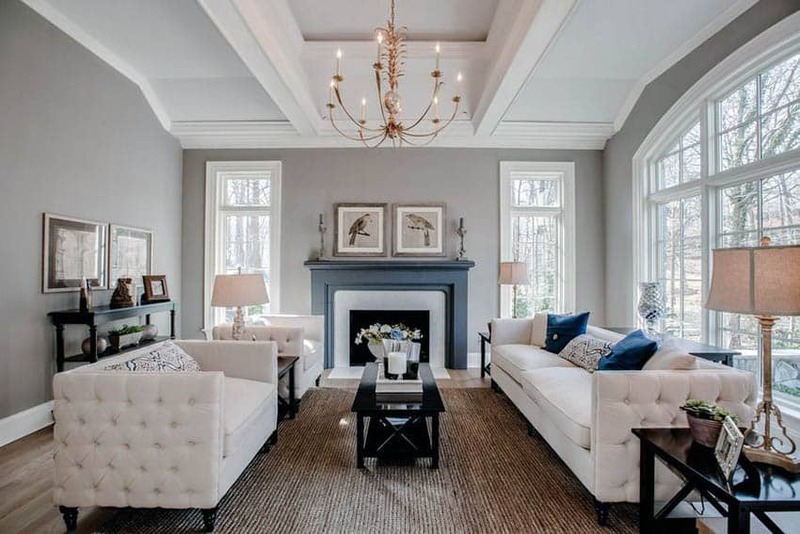 On the average, renovations for ceiling treatments in living rooms run from $500 to $2300 per project, varying on the types of material used, the complexity of the project, the type of labor and installation. Projects which are more complex are obviously more expensive. Some of these require multiple stage installations such as constructing a built up or drop ceiling and applying features. The height of the ceiling is also a critical aspect of the cost since high ceilings require added scaffolding and are more difficult to deal with. The shape of the ceiling is also another cost factor as slanted and curved ceilings are much harder to install than flat ceilings. The more complex the design of the ceiling is the more extensive the prep work is, the more site visits required and the more added staging and equipment needed for construction. Although moldings and trims are small part of a living room’s decor, they also contribute to added costs. Ceiling cornices and baseboards, for example, typically run the full expanse of the living room’s perimeter, thus they require a good amount of material, depending on the size of the room. Consequently, the main factor that affects the cost of materials for living room decorative trims is the size of the room. On the average, the typical cost of decorative trims for living room renovations can run from $300 to $1370 per room, depending on the size of the space, the type of material and the design of the molding. • Furniture, furnishings and equipment – Furniture, furnishings and equipment all make up the decor of a space. These pertains to all items added to a room once it is fully renovated. In general, furniture for living room remodel projects may either be built in or freestanding. The former means that it is fixed onto a wall while the latter pertains to those that can be moved. Furniture items for living rooms include three seater sofas, love seats, arm chairs, recliners, accent chairs, center or coffee table, side tables , tv cabinet, console table and shelves, to name a few. Furnishings, on the other hand, pertain to accessories and decor such as window treatments like curtains, blinds or shades, textiles and fabric, throw pillows, area rugs, accent pieces and decorations like artworks, frames, figurines, etc. While equipment for living rooms typically include flat screen TV’s, home entertainments systems, etc. The total cost of furniture for living rooms has no fixed amount as it varies greatly depending on the amount of furniture needed, its size, the material they are made of and their brand. When choosing living room furniture, be sure to compare prices from different suppliers so you can get the best deal. Do some window shopping online or in big box stores to see which ones best fit your taste and the overall style you want to achieve for your living room. • Seating furniture – The basic seating options in furnishing a living room include couches, arm chairs and recliners while the special options include high back chairs, bar stools and accent chairs. Depending on the purpose of your living room, you may want to consider on investing on new furniture. However, if you are dealing with a limited amount of budget and still want to make use of old items, you can take other alternatives such as refurbishing or re upholstering existing sofas. Reupholstering sofas and chairs also offer a good way to make use of old furniture that does not match the new color palette of your newly renovated living room. Reupholstering chairs allows you to keep usable pieces, minimizes waste and also saves a good amount of money. Look for professionals who specialize in making old furniture look brand new and consult with at least three suppliers to have a good basis of comparison when it comes to the estimates for fabric and labor. In that way, you get to see if it will be cheaper to fix your old furniture or buy new ones. • Built in furniture – Other miscellaneous pieces of furniture which may be added to living rooms during remodelling are built in shelves and cabinets. Custom cabinetry and shelving add extra appeal to a living room, while functioning as a display, bookcase or media center. Built in shelves are multipurpose because they can be used for storing small items like books or alternatively, they work well in displaying accessories and other decorations. Built in cabinets, on the other hand, are common for living rooms with television sets and media devices such as entertainment systems. When designing built in furniture for a living room renovation project it is important to plan ahead and hire a professional designer and contractor to help you out with the process. Commissioning a professional ensures that your built in furniture does not only meet your specific needs, but that they are also tailor made based on the existing conditions and size of your living room. In addition, they can assist you in creating creative and optimum storage systems such as media cabinets which match with the overall look of your living room. Adding built in shelves and custom cabinets and media centers will require the services of a finish carpenter or a cabinet maker. On the average, the cost of installing built in furniture for living room renovation projects run from $290 to $1300 per unit, with prices varying based on the type of material and finishing, its size, style and the complexity of the design. Lighting – Changing and upgrading lighting fixtures is also a significant part of living room renovations, since a good lighting layout and design can significantly improve the mood and ambiance of a space. While most light fixtures can be easily changed, adding new lighting fixtures, outlets and switches are not meant for “do it yourself” projects due to their sensitivity. Making changes to a lighting and electrical layout is only easy if the ceiling frames are exposed as there is no need to remove ceiling boards and cause additional damage to the home. But as mentioned living room renovation projects that involve electrical work may require hiring an electrician. On the average, the typical cost of lighting improvements for living room remodels can range from $400 to $1800 depending on the complexity of the lighting layout, the types of fixtures and its quantity. Some electricians also charge on a per lighting fixture basis, instead of a lump sum amount. Also, expect to pay added costs for extra wiring, switches and convenience outlets. Windows – If your living room lacks ventilation or looks too dark, you can also try to replace existing windows or add windows to your living room. Replacing old windows helps improve natural lighting, optimizes energy efficiency and gives added ventilation. In addition to the practical benefits, new windows can also contribute a new character to your living room. A good way to cut on costs when improving windows for living rooms is to furnish them with a window treatment. You can either buy new curtains, shades or blinds, depending on the prevailing style of your home. Window treatments are available in different types of materials and present a wide range of choices when it comes to design, colors and patterns. On the average, the price of installing new windows for a living room remodel run anywhere from $300 to $1500 depending on the type of material, the size, and the quantity of windows needed to complete the project. Replacing windows may also incur extra costs in terms of prep work as sometimes walls may need to be repaired before accommodating the new windows. Expect added costs for any changes in the trims and sidings both in the interior and exterior of the house. Also, factor in any added window treatments to your overall remodeling budget. Other special features – Some living room remodel projects may showcase special features like a fireplace.Fireplaces do not only improve the aesthetic appeal of a living room but they also serve practical benefits for houses situated in regions with cold temperatures. 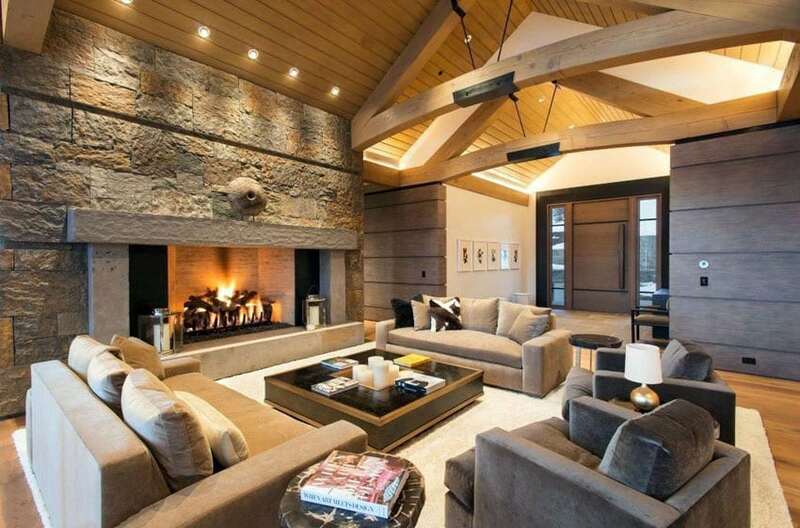 Adding a fireplace to a living room would require a special budget because its materials typically include special finishes like natural stones, tiles or custom mill work. The installment of a new fireplace also entails a large amount of work may require changes in the exhaust system of the house, equating to additional costs. 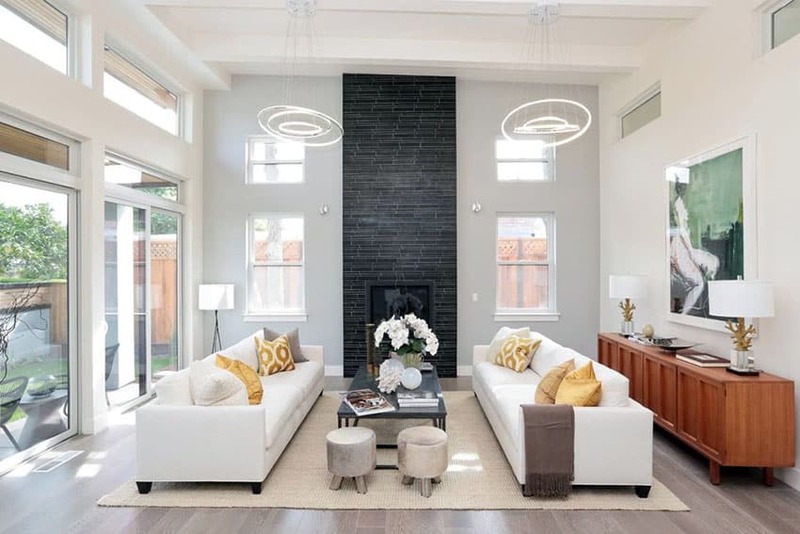 On the average, the cost of fireplace projects range anywhere from $560 to $2500 for living room remodels, depending on its size, material and design. Location of the project – The location of your home also has a significant impact on the total cost of your living room remodel project. This is mainly because labor and material costs varies greatly in different areas. Living room remodels in small towns cost much less as compared to a metropolitan area. In general, there are two major factors which make up the total cost of a living room remodel project namely : the labor cost and the material cost. Based on estimates, about 15 to 30 percent of total project cost goes to the labor, while the remaining 70 to 85 percent accounts for the materials. The average costs for living room remodels run a minimum of $518 for a 300 to 400 square foot space, while for areas which have an area of 400 to 500 square foot. have an average cost of $782. The prices increase accordingly as the size of the space vary, so naturally larger living rooms that are 500 to 600 square feet in size cost $982, while spaces that have an area of 600 to 800 square foot have average remodeling costs that run anywhere for, $1200 to $2000. 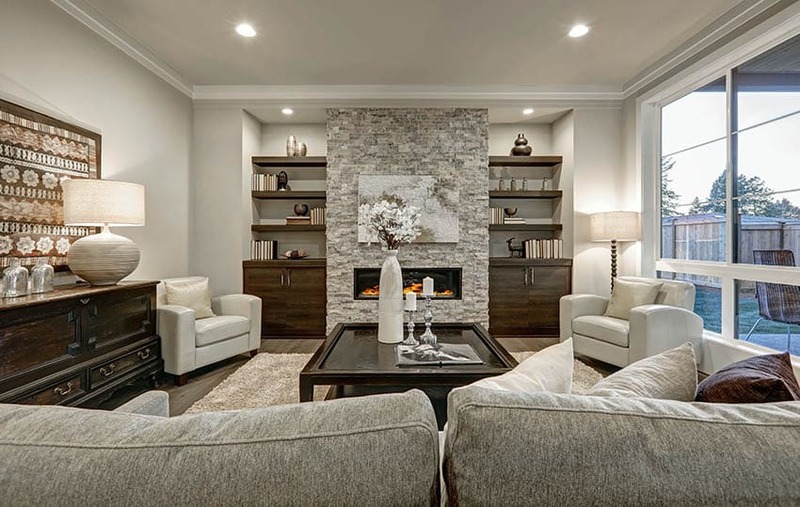 For living room remodels that have undergone previous improvement works cost less compared to full renovation projects which involve a complete scope of work. They cost an average of $850 and $1200 respectively. Consult a professional – When in doubt, always hire a professional to help you with your living room remodel project. Skimping on labor may save you money at present, but may result to added problems in the long run. Professionals like contractors, designers and workers have years of experience to back up their know how on construction and you can be assured of a good quality of work and end product which will last for years. In addition, talk to a few professionals so you can get a realistic comparison of the construction, architectural and design services. Having at least three cost estimates to work with gives you enough basis to get the best deal for your money. Keep a list – Creating a list of the things that you need for your living room remodel project allows you to keep track of the expenses that you might incur as you go along with the renovation. Prioritize important items first, then put a contingency for extra items like accessories and other decorations. Leave room for finishing touches as they can go a long way in terms of visual appeal. Think of a secondary purpose for your living room – A good way to optimize space, whether dealing with a small living room or a large living room, is to use it for a secondary purpose. Nowadays, most homes combine two areas together such as a living room with a music room or home office. The best way to take advantage of a living room remodel is to incorporate a secondary purpose for your space and you can do this by carefully planning the layout and design essentials ahead of time. Aside from that, multipurpose furniture such as sofa beds also help achieve a dual function living room.